К сожалению статья была удалена на первоисточнике. About 40 years ago, a gentleman inherited a bunch of old coins. He stored them safe and sound in a closet. And there they stayed. That is, until he started thinking about buying some gold as an investment and took his coins to Bellevue Rare Coins to get a free evaluation. Both the gentleman and the employee evaluating the coins were in for a huge surprise. His was no ordinary coin collection. 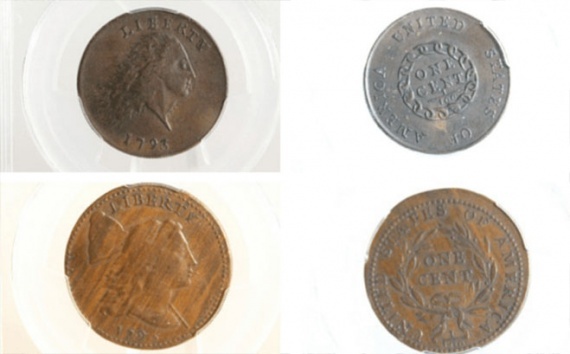 Among the very well maintained collection, two incredible one-cent coins were discovered: some of the very first U.S. cents ever minted. Both cents were from 1793, and both featured the classic Liberty Cap obverse design, successor to the Flowing Hair design. How the coins differ, however, is part of what makes their history so remarkable. The first coin of the two minted was the “Chain Cent.” Its reverse design features 13 links, representing the 13 colonies. This design was controversial, because many people believed that the chains represented slavery, and not the colonies. And so, another design for the reverse side was ordered. The controversial chain design was replaced with a wreath. The “Wreath Cent” and “Chain Cent” were two of the most extraordinary coins in the gentleman’s collection. In addition to being historically relevant, these coins also have numismatic significance. These cents are so rare that it’s unusual to have more than one in good condition turn up in a year. Much less two at once! The Chain Cent is one of only six in AU53, or almost uncirculated condition. Bellevue Rare Coins graded the coins on sight. The Chain Cent alone is valued at over $100,000, while the Wreath Cent is worth well over $50,000. It’s safe to say that this man’s decision to have his coin collection evaluated paid off. Oh, and remember he was interested in buying gold? Well, Bellevue Rare Coins took care of that, too. In exchange for his coins, this gentleman walked out with enough gold to last him another 40 years.